29 Holmes Beach Vacation Rentals. Holmes Beach located on the Gulf of Mexico in Florida, features an amazing selection of rental villas, condo rentals and vacation homes direct by owner. Holmes Beach is the largest of Anna Maria's Island and is between the towns of Bradenton Beach & Anna Maria. This small town is quite appealing as it sits on white sandy beaches next to the beautiful waters of the Gulf. Holmes Beach is an amazing place to witness some of the most appealing sunsets along the shoreline you would ever witness. You have 29 rental properties to view; 29 are premium owners. This rental boasts: 2 bedrooms, 2 baths, is a Condo located Near Beach! This community is home to the majority of the islands first class dining establishments and shopping to soothe your soul. As mentioned there are no fast food or chain stores located at Holmes Beach. You can enjoy tasty international cuisines prepared by worldclass chefs. These amazing meals range from elegant to affordeable depening on the mood you are in that day. The best part of the meal is you will be able to enjoy the amazing sunsets with your family or spouse. There are several activities that you can enjoy while staying at your Holmes Beach Vacation Rental. You can enjoy the day sunbathing on the white sandy beaches and get that amazing Florida Tan. There are also several water activities you can participate in such as: swimming, jet skiing, sailing, parasailing, along with great fishing. You can rent boats and other watercrafts. Or you can get your exericise in by running along the ocean on the beach in the morning before everybody gets up and begins their day. If you are there with your spouse enjoy a nice romantic walk in the evening along the beach, while listening to the waves of the ocean. While staying in Holmes Beach you can also enjoy short trips to other nearby hot spots such as Bradenton and Sarasota, along with St. Petersburg, Tampa or even Orlando. They are just a short drive away. As you can see Holmes Beach is a unique vacation destination. This is a great place to enjoy your time away from the city life, yet have all the fun filled activities you want in a vacation. 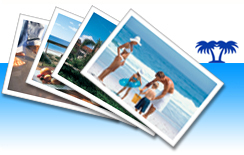 You can view a great selection ofvacation rentals by ownerat ivacationonline.com and book it online using ourvacation rental management software.Your next dream vacation can be booked in just a few minutes!